Is Your Water Safe ? 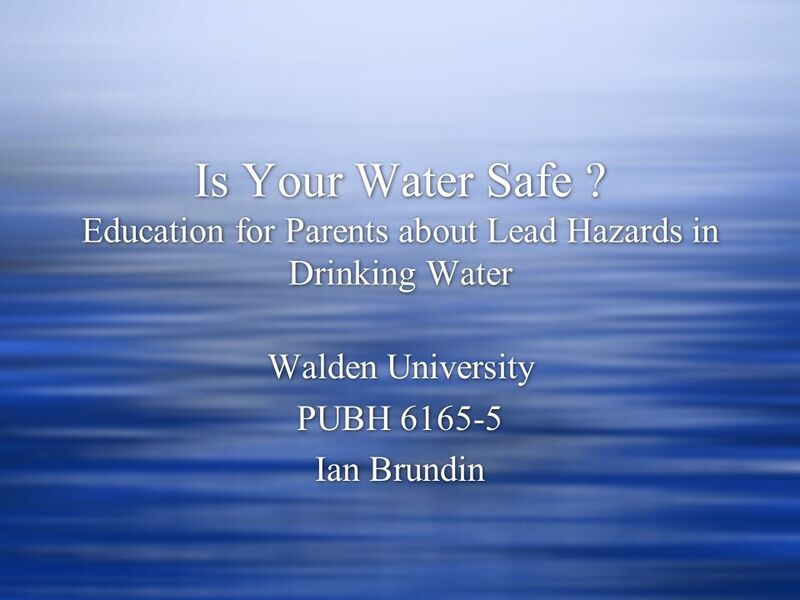 Education for Parents about Lead Hazards in Drinking Water Walden University PUBH 6165-5 Ian Brundin Walden University PUBH 6165-5. 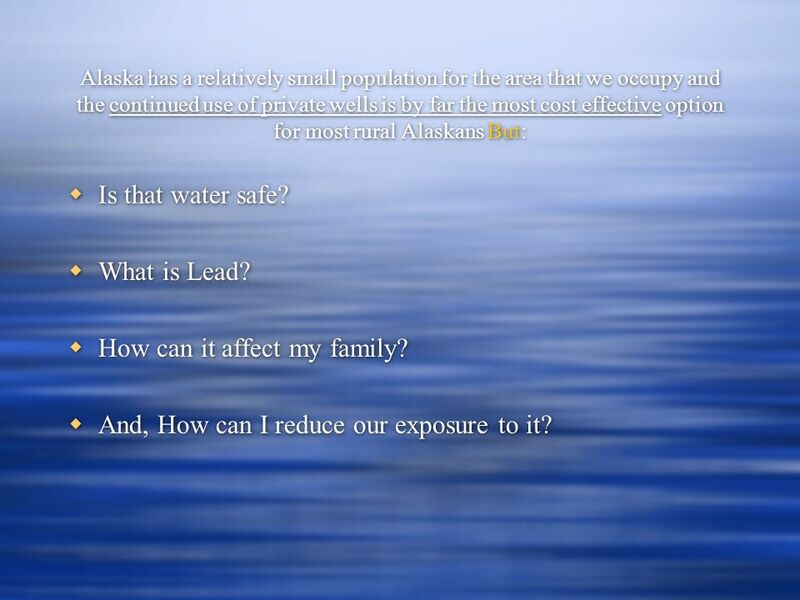 2 Alaska has a relatively small population for the area that we occupy and the continued use of private wells is by far the most cost effective option for most rural Alaskans But: Is that water safe? What is Lead? How can it affect my family? And, How can I reduce our exposure to it? Is that water safe? What is Lead? How can it affect my family? And, How can I reduce our exposure to it? 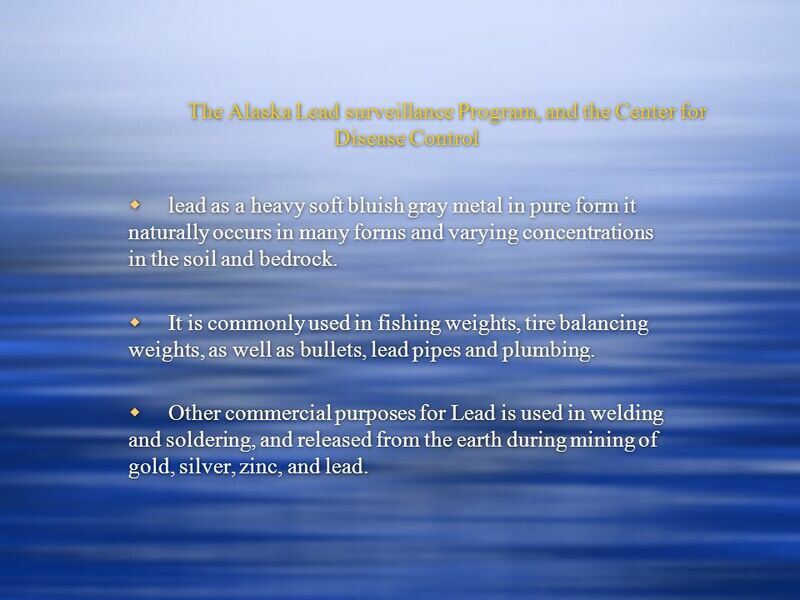 3 The Alaska Lead surveillance Program, and the Center for Disease Control lead as a heavy soft bluish gray metal in pure form it naturally occurs in many forms and varying concentrations in the soil and bedrock. It is commonly used in fishing weights, tire balancing weights, as well as bullets, lead pipes and plumbing. Other commercial purposes for Lead is used in welding and soldering, and released from the earth during mining of gold, silver, zinc, and lead. lead as a heavy soft bluish gray metal in pure form it naturally occurs in many forms and varying concentrations in the soil and bedrock. It is commonly used in fishing weights, tire balancing weights, as well as bullets, lead pipes and plumbing. Other commercial purposes for Lead is used in welding and soldering, and released from the earth during mining of gold, silver, zinc, and lead. 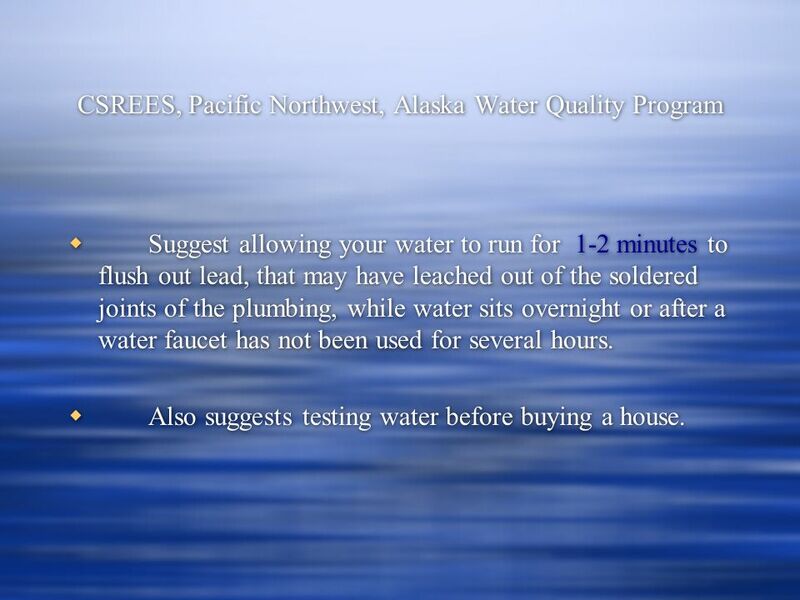 4 CSREES, Pacific Northwest, Alaska Water Quality Program Suggest allowing your water to run for 1-2 minutes to flush out lead, that may have leached out of the soldered joints of the plumbing, while water sits overnight or after a water faucet has not been used for several hours. Also suggests testing water before buying a house. Suggest allowing your water to run for 1-2 minutes to flush out lead, that may have leached out of the soldered joints of the plumbing, while water sits overnight or after a water faucet has not been used for several hours. Also suggests testing water before buying a house. 5 EPA safe water The EPA safe water home page states, All of us need clean water to drink. We can go for weeks without food, but only days without water. Contaminated water can be a threat to anyones health, but especially to young children. Lead has no known value to the human body, and is a heavy metal and considered Toxic to the body, especially to children and the nervous system. There is no known safe level for children of any age who are still growing and developing their nervous systems, or for low dose exposure over long periods of time. 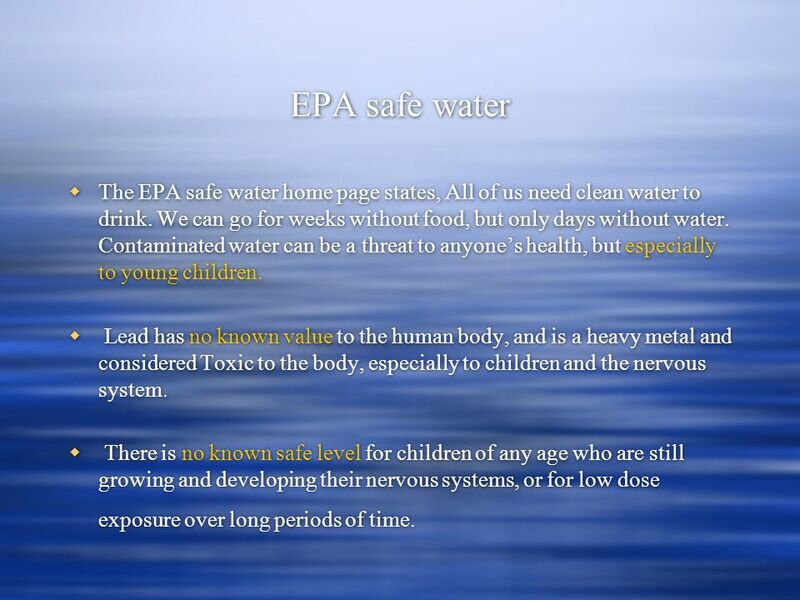 The EPA safe water home page states, All of us need clean water to drink. We can go for weeks without food, but only days without water. Contaminated water can be a threat to anyones health, but especially to young children. Lead has no known value to the human body, and is a heavy metal and considered Toxic to the body, especially to children and the nervous system. There is no known safe level for children of any age who are still growing and developing their nervous systems, or for low dose exposure over long periods of time. 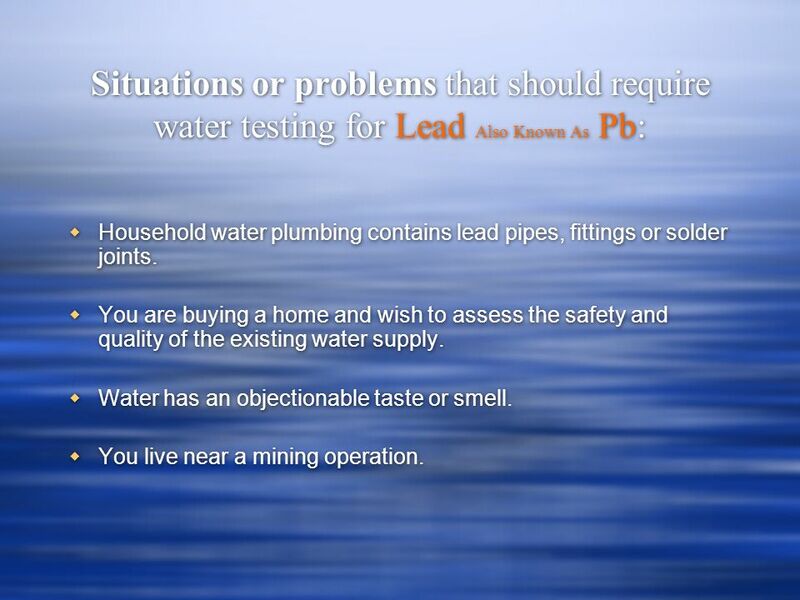 7 Situations or problems that should require water testing for Lead Also Known As Pb: Household water plumbing contains lead pipes, fittings or solder joints. You are buying a home and wish to assess the safety and quality of the existing water supply. Water has an objectionable taste or smell. You live near a mining operation. 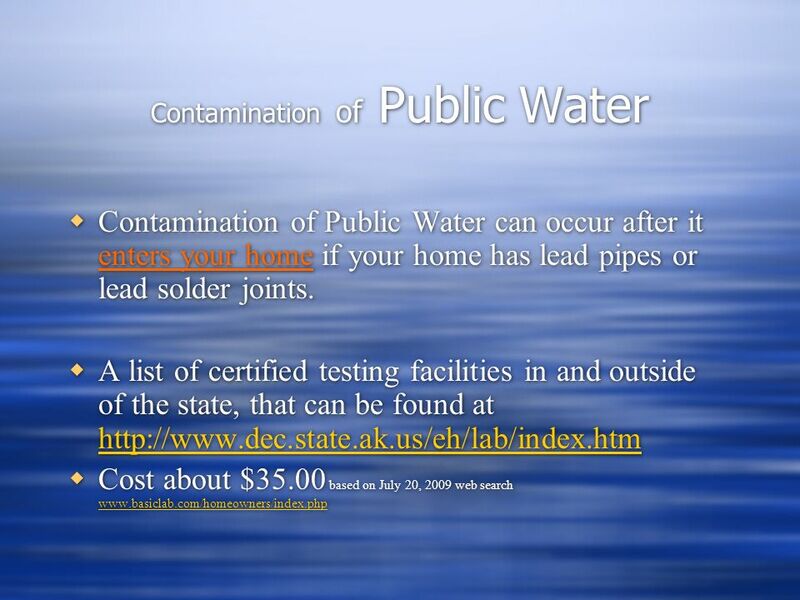 Household water plumbing contains lead pipes, fittings or solder joints. You are buying a home and wish to assess the safety and quality of the existing water supply. Water has an objectionable taste or smell. You live near a mining operation. 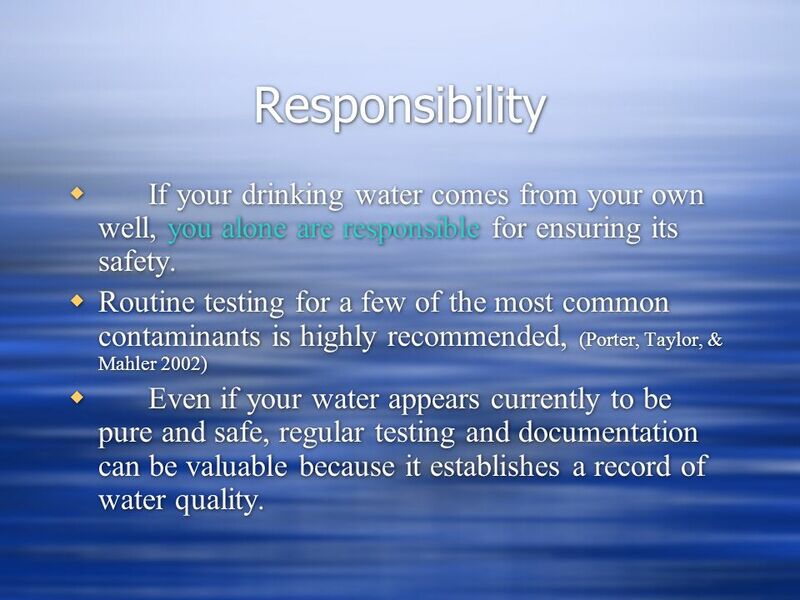 8 Responsibility If your drinking water comes from your own well, you alone are responsible for ensuring its safety. Routine testing for a few of the most common contaminants is highly recommended, (Porter, Taylor, & Mahler 2002) Even if your water appears currently to be pure and safe, regular testing and documentation can be valuable because it establishes a record of water quality. If your drinking water comes from your own well, you alone are responsible for ensuring its safety. Routine testing for a few of the most common contaminants is highly recommended, (Porter, Taylor, & Mahler 2002) Even if your water appears currently to be pure and safe, regular testing and documentation can be valuable because it establishes a record of water quality. 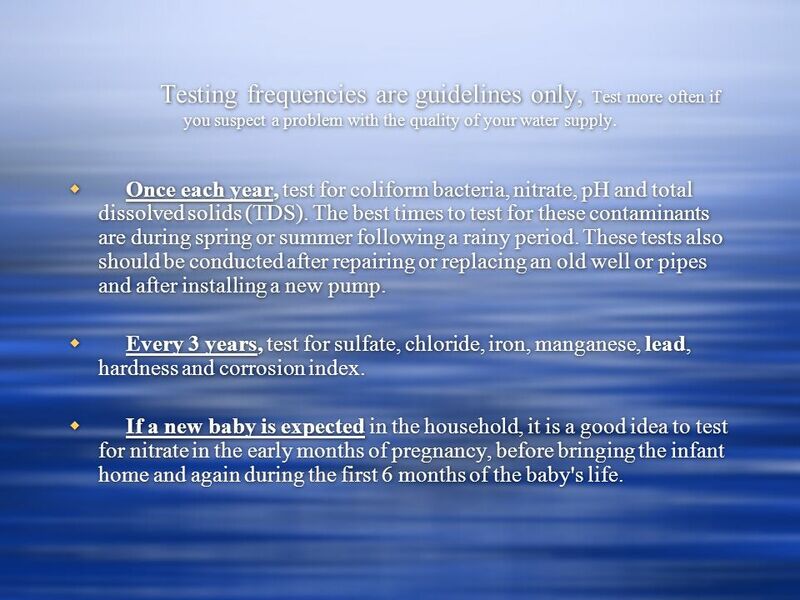 9 Testing frequencies are guidelines only, Test more often if you suspect a problem with the quality of your water supply. Once each year, test for coliform bacteria, nitrate, pH and total dissolved solids (TDS). The best times to test for these contaminants are during spring or summer following a rainy period. These tests also should be conducted after repairing or replacing an old well or pipes and after installing a new pump. Every 3 years, test for sulfate, chloride, iron, manganese, lead, hardness and corrosion index. If a new baby is expected in the household, it is a good idea to test for nitrate in the early months of pregnancy, before bringing the infant home and again during the first 6 months of the baby's life. 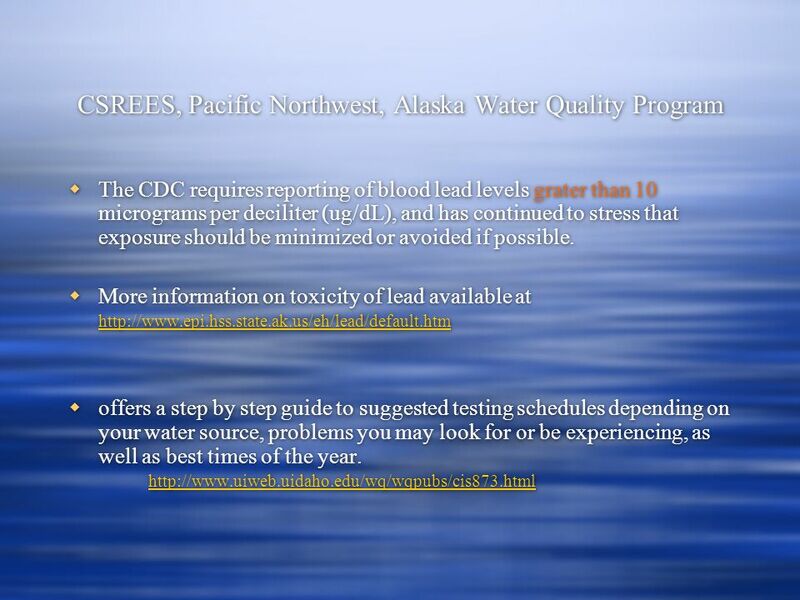 Once each year, test for coliform bacteria, nitrate, pH and total dissolved solids (TDS). The best times to test for these contaminants are during spring or summer following a rainy period. These tests also should be conducted after repairing or replacing an old well or pipes and after installing a new pump. Every 3 years, test for sulfate, chloride, iron, manganese, lead, hardness and corrosion index. If a new baby is expected in the household, it is a good idea to test for nitrate in the early months of pregnancy, before bringing the infant home and again during the first 6 months of the baby's life. 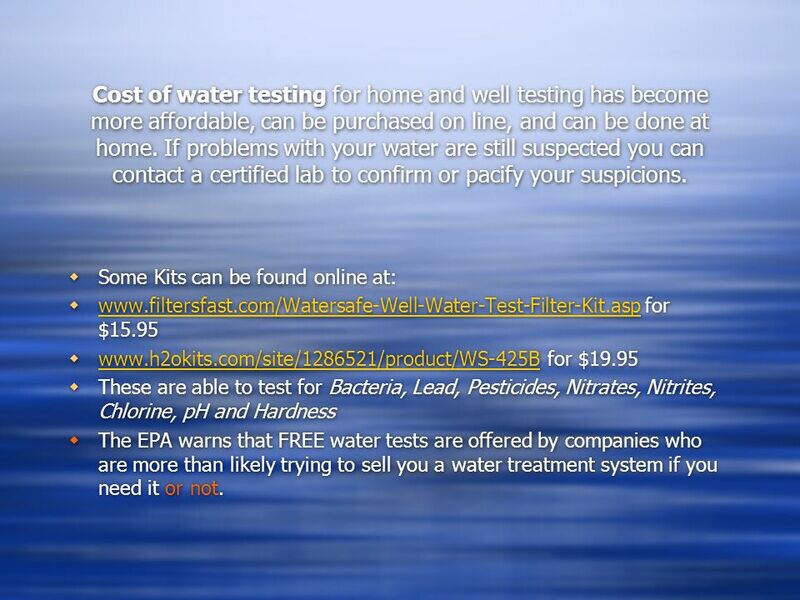 10 Cost of water testing for home and well testing has become more affordable, can be purchased on line, and can be done at home. If problems with your water are still suspected you can contact a certified lab to confirm or pacify your suspicions. Some Kits can be found online at: www.filtersfast.com/Watersafe-Well-Water-Test-Filter-Kit.asp for $15.95 www.filtersfast.com/Watersafe-Well-Water-Test-Filter-Kit.asp www.h2okits.com/site/1286521/product/WS-425B for $19.95 www.h2okits.com/site/1286521/product/WS-425B These are able to test for Bacteria, Lead, Pesticides, Nitrates, Nitrites, Chlorine, pH and Hardness The EPA warns that FREE water tests are offered by companies who are more than likely trying to sell you a water treatment system if you need it or not. Some Kits can be found online at: www.filtersfast.com/Watersafe-Well-Water-Test-Filter-Kit.asp for $15.95 www.filtersfast.com/Watersafe-Well-Water-Test-Filter-Kit.asp www.h2okits.com/site/1286521/product/WS-425B for $19.95 www.h2okits.com/site/1286521/product/WS-425B These are able to test for Bacteria, Lead, Pesticides, Nitrates, Nitrites, Chlorine, pH and Hardness The EPA warns that FREE water tests are offered by companies who are more than likely trying to sell you a water treatment system if you need it or not. 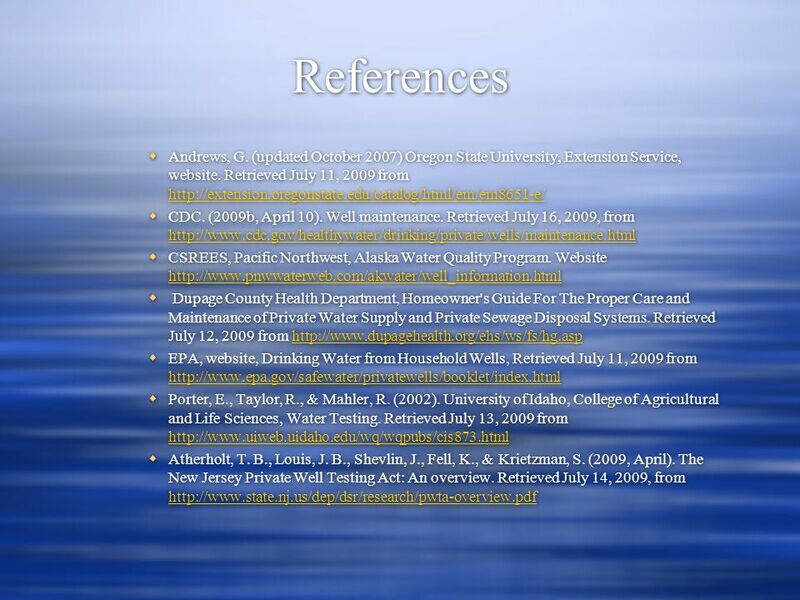 Download ppt "Is Your Water Safe ? Education for Parents about Lead Hazards in Drinking Water Walden University PUBH 6165-5 Ian Brundin Walden University PUBH 6165-5." Certain types of bacteria indicate animal and human waste pollution. PubMed Limits Here is the Limits page. Searches can be limited by restricting terms to fields or setting specific date or record tagging parameters. 1 ACS Statistical Issues and Challenges: One-, Three-, and Five-year Period Estimates Michael Beaghen U.S. Census Bureau New Jersey State Data Center Annual. New Jersey Private Well Testing Act Vas Komanduri & Marc Ferko Office of Quality Assurance. Groundwater What is it and why is it important? 1 Revised Alaska Developmental Profile Training Presentation Jeanne Foy, Assessment Unit, Department of Education and Early Development. Infant Feeding and Carers Surveys Steve Webster NHS IC. 1 An Introduction to Filtering: Issues and Possible Solutions Sarah Ormes UKOLN University of Bath Bath, BA2 7AY UKOLN is funded by the Library and Innovation. 1 West County Road 112 Groundwater Plume Site Community Meeting Midland County Horseshoe Event Center Midland, Texas Texas Commission on Environmental. Lead-Based Paint Renovation, Repair, and Painting Rule Overview of RRP Rule EPA Region 8 ************ Jim Maley. 1 Ben Bahlenhorst Zheng Fu Joe Hill Ian Laird Long Nguyen Binh Phan. WASH Cluster – Water in Emergencies W W2 1 Water in Emergencies Session 2 Water Needs. Drinking Water. Safe Water is Important Used for drinking, cooking, cleaning, bathing, etc. Regarding Water Quality Frequently Asked Questions. Kent Theurer NDSU Agriculture Communication Whats Your Plan? Lead Poisoning Prevention in Migrant Populations Bonnie L. Hinds Extension Specialist May 2013 1.